NASHVILLE, Tenn. – Feb. 17, 2015 – Detroit Assurance has been named a 2015 Top 20 Product Winner by Heavy Duty Trucking magazine. Presented to the most innovative and significant new products that address industry issues and help fleets improve their bottom line; this marks the fourth year in a row that a Detroit Diesel Corporation (Detroit) solution has received the distinction from Heavy Duty Trucking magazine. Introduced in 2014, Detroit Assurance offers complete integration of Detroit powertrain and safety systems. Radar guided adaptive cruise control, advanced collision mitigation technology and lane departure camera system provide the driver with maximum situational awareness and peace of mind. When necessary, the system can warn of a potential hazard and even bring the truck to a stop. Heavy Duty Trucking has recognized Detroit as a Top 20 Product Winner each of the previous three years. Detroit Virtual Technician™, the onboard diagnostic system, won in 2012. Offering the next generation of integrated performance, the DT12™ automated manual transmission was named a winner in 2013. 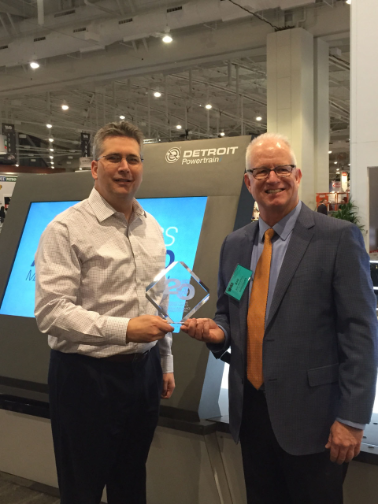 The full telematics solutions suite, Detroit Connect, received the honor last year. To select Top 20 product winners, Heavy Duty Trucking editors review all product announcements made between December 2013 and November 2014. After the field is narrowed to 36 candidates, a panel of highly respected fleet executives and maintenance managers score and select the 20 finalists. All of the winners will be recognized in the February 2015 issue of Heavy Duty Trucking. The 2015 awards were presented at the Technology and Maintenance Council meeting in Nashville, Tenn.
For more information about Detroit Assurance, visit www.DemandDetroit.com. Vic Meloche accepted the award on behalf of Detroit from Bill Madden of Heavy Duty Trucking.